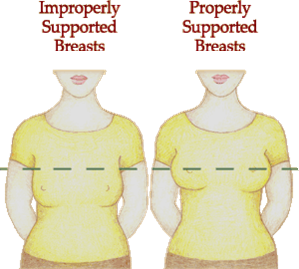 An improper ill-fitting bra gives little or no support, and distorts the breast tissue. It will often impeding circulation, and in extreme cases, divide the tissue of the breast into separate glandular masses. 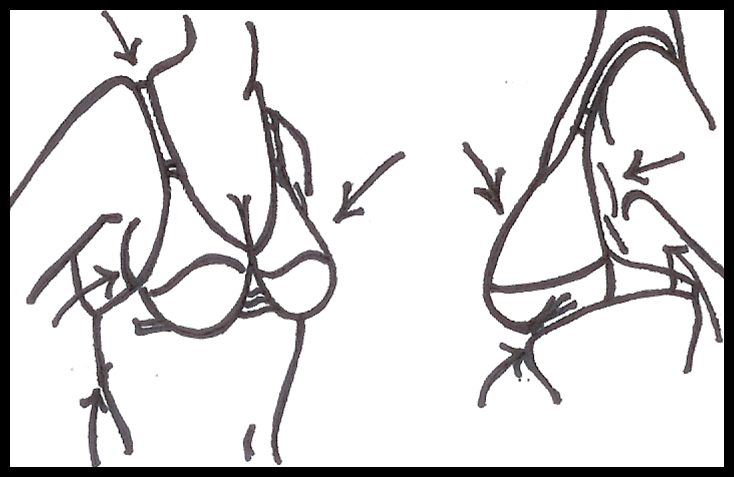 An ill-fitting bra displaces the breast tissue pushing it under the arm, flattening it farther over the chest wall, or allowing the figure to become droopy and pendulous. Most bras tend to constrict both the blood circulation, and the type of lymphatic drainage from the breast, which may play a major part in breast disease. The breast is subject to movement, and stretches due to the pull of gravity with every step if not properly supported. The least a woman should do is perform monthly self-breast examinations, and wear a properly fitted orthopedic type bra to give proper support. Most of these women buy bras that not only do not adequately support and protect their breast, but the bras they wear are really a source of irritation as well. Through the years they develop pendulous, matronly looking breast because of a lack of proper support from their bras. The breast tissue moves with each step in an ill-fitted bra so that the collagenous fibers supporting the tissue is stretched or broken, stretch marks are visible in the skin. The breast tissue is displaced under the arms, down the midriff and into a now pendulous bust line. A properly fitted bra, worn through the years, will keep that youthful figure a woman desires. The fuller figured woman has the greatest problem for finding a bra that really fits and supports. The extra weight of her breast not only compounds the problems previously mentioned, but makes it nearly impossible, in today’s marketplace, to find a bra that fits correctly. Most bras only provide support by being suspended from a sliding shoulder strap. The pressure makes deep, painful grooves in women’s shoulders. Elastic straps progressively stretch, causing the problems described above. The weight of the breasts can also cause posture problems. The correctly fitted bra on the other hand provided proper support, relief from sore shoulders. It minimizes the appearance of the fuller figure by facilitating improved drainage of accumulated breast fluid afforded by improved circulation. She looks thinner and is more comfortable. The pregnant woman is experiencing many changes in her body. The proper fitting bra can help provide gentle and firm support to aid the increase in the breast’s fullness. A woman who has undergone a mastectomy has special needs. A correctly fitted bra can assure that the prosthesis can be worn with comfort and security and that the woman has renewed confidence and self-esteem. 1. Control weight. Avoid caffeine, dairy and yeast products. Drastically reduce dietary fats, particularly low density fats, but get adequate essential fats like cod liver oil. Keep the colon functioning well with a wide variety of fiber food (veggies). Limit your stress. Take Vitamins C and E, Beta Carotene a balanced B Complex Formula and the minerals, Selenium and Chromium. 2. Maintain an exercise program and strengthen pectoral muscles. 3. Buy and wear proper custom-fitted bras that will reposition your breast tissue to its natural position and give you the support you need to comfortably keep your bustline in its proper place.